Slowly but surely, more of the apps which are considered staples on other platforms are becoming available for Windows Phone 8. The latest is music and media recognition app Shazam, and while it has been out for Windows Phone 7.5 for a while, and Windows Phone 8 was supported, the latest version has a new look, and new features. 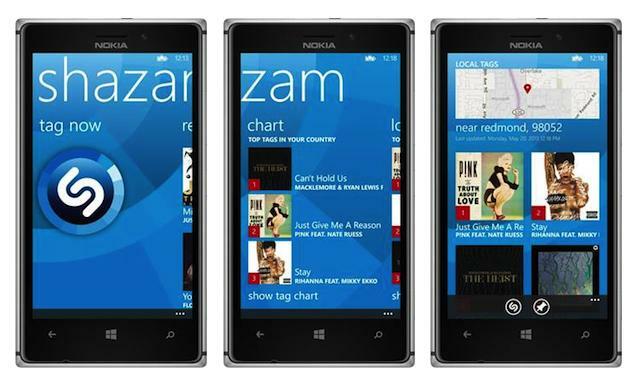 Shazam has embraced the Windows Phone design, as you can see from the pictures above, using big, bold – and flat – images for album artwork, plus the usual side-scrolling system to access other features. The app is free to download, and offers unlimited tagging – that’s what Shazam calls its identification process – of music, TV shows, and if you’re really keen, adverts too. Shazam has also enabled tagging from the home screen Live Tile, which should really speed up the process for frequent users. Despite being able to recognize other things, music has always been Shazam’s speciality. Now, after tagging a song, users can hop over to Xbox Music, or Nokia Music if they’re using a Lumia phone, and purchase the song instantly. Other features include lyrics for tagged songs, reviews and bios, and sharing over Twitter and Facebook. The app is location aware, and will update a local list of tagged music every 30 minutes. Interestingly, this can be viewed on a Live Tile, or set as wallpaper on the lock screen. The release of Shazam for Windows Phone comes soon after a major iPad app update was released, where in addition to a complete redesign, integration with Rdio and Spotify was also added. While integration with Xbox and Nokia Music are free features on Windows Phone, Spotify can only be used by those who’ve paid for the premium version on iOS. It’s not clear what will happen to the premium, $6, Shazam Encore app for Windows Phone, but the new free version should be ready to download as you read this.